Writer Chats is an occasional series featuring conversations with writers, editors, and creatives. These posts include affiliate links, so if you purchase a book, I may receive a small commission. You know the people you keep in touch with, but can’t remember how you stumbled into each other’s lives? That’s me and Andi Cumbo-Floyd. We’re online friends who met somewhere on the Internet a while back, and I’m so glad our paths crossed. Andi has a heart for encouraging writers, so she published a book on the subject. 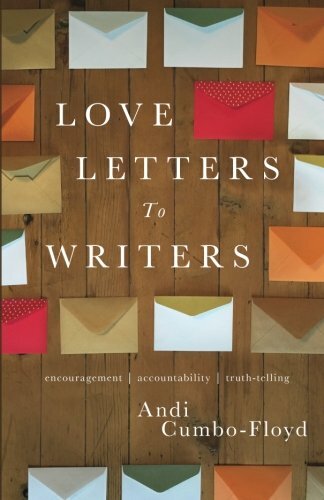 Love Letters To Writers: Encouragement, Accountability, and Truth-Telling is a comforting read at any stage in the writing process, and I was happy to chat with her and learn more about her daily writing rituals. Andi lives on a farm in Virginia’s Blue Ridge mountains with her husband, son, four dogs, four cats, six goats, three rabbits, and thirty-six chickens. What prompted you to start writing love letters to writers? I've been coordinating an online writing community for a few years now, and each week, I send the people in that community a letter inspired by a question they ask, something I'm pondering in my writing life, or something I've read. A member of that community, Amanda Eastep, suggested I compile some of those letters into a book for a wider audience, and I loved that idea because I love writing those letters to those people so much. I hope they are meaningful to others, too. Many of your readers are also writers. What are some of the biggest challenges you see come up again and again in your community? Time management and priorities. Most writers don't make a living from writing alone—be that in book sales or freelancing—so we have to do other things to pay our bills. Often, then, writing gets sidelined because of energy and family demands and because, well, it's hard. Writing isn't hard in the way that walking miles for water is hard or mining diamonds, but it is energetically and psychologically challenging, and so we often put everything else in front of it, letting our limited time to write become overwhelmed with other things. So I've found that setting priorities and making a schedule around them is crucial, or else the time just gets frittered away, even in good things. How does your life on a Virginia farm inform your writing, or affect your writing rhythms? Well, in the most fundamental way, farm life keeps me grounded. Given that we have animals who need to be fed both morning and evening, we are here most of the time, and since I work from home, I’m here almost all the time. The rhythms of this life keep me stiller than when I was a professor or worked outside the farmhouse. The seasons, though, affect my writing rhythms much more now. In the winter, I can write early in the day because I don't need to be outside in the garden when the day is cool. But come summer, that first energy has to go to the garden - planting, weeding, harvesting—because that's when I can tolerate the temperature, which means I need to then find a way to words a bit later. That can be a challenge, but one I embrace to keep this lifestyle. What are some of your favorite ways of getting out of a creative rut, or reigniting your writing life? Reading is always my go-to. When I feel dried up and parched around words, I immerse myself in books of all sorts. I just read and read, and then I feel the moisture of language coming back. I also think that sometimes time away is necessary. Time to just ponder ideas and look at art and take long walks. Cook good food. Spend time with people who love you and whose lives make you smile. Then, go back. Writers (myself included) are often hard on ourselves. Why do you think that is, and how can we be kinder in the process? Oh yes, I think that's part of the nature of creativity, that it requires so much vulnerability, so much risk and we are bound to want to only put the best ourselves out there. And it's hard to tell what the best is because we aren't always great judges of our own work. Add to that a culture that doesn't value art a great deal and values the work of the artist even less, and you have a potential for great despair around our work. How do you write? Pen and paper? At the computer? A favorite chair? Cup of tea? Tell us about some of your habits and rituals. Mostly I write at the computer except for my morning journaling sessions. I do often start my daily writing sessions with some free-writing that begins with a line from a poem that I've just read. This time of year, I write in our living room by the wood stove, but a lot of the year, I write in my office with a couple of heaters running and a couple of hound dogs nearby. I usually have a candle lit and a drink—hot in winter, cold in summer—nearby. And I always surround myself with the art and objects I love.